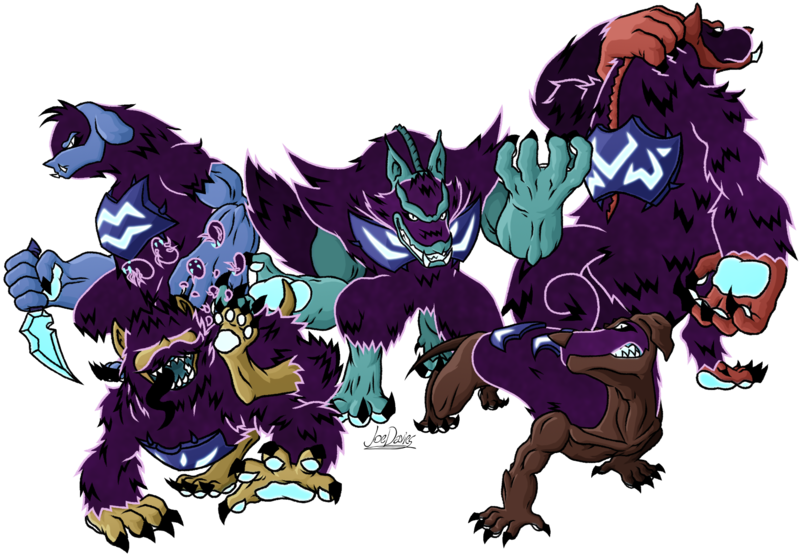 The Skorned are the main antagonists of Golden Sky Hero. Races may come in many shapes, sizes and personalities, but every single Skorned have one thing in common; they’re diabolical and evil. However, they were not always like this. Once upon a time, they were a proud and stalwart race called the Valderverr; a race of human-wolf hybrids. And they had a very neutral stance in the battle between those who worshipped light and those who worshipped darkness. But three Valderverr; Skolliath, his brother and his father, used the chaos and confusion of the Great War of Dark and Light to their advantage by performing a ritual to steal all the world’s light and darkness and claim world supremacy. Most of the Valderverr race tried to stop them, but unfortunately, the ritual was a success, and an intense beam of light and darkness struck the altar, which created a massive shockwave. The Valderverr that were caught up in the shockwave had their bodies mutated by the power of darkness and turned into the Skorned. Now, as Skolliath had obtained ultimate dark power, he used to manipulate and control the entire Skorned race; to make them obey his every whim. Goodness knows if there’s any humanity left in any of the Skorned, but if there are, it is trampled by their corrupted nature; now dark and malicious, and seeking only to feed and destroy. They see other living creatures and races as food or slaves to Skolliath’s whim. Their bodies were each changed into a different colour, and their fur coats are made out of darkness. With this power, every Skorned is now invulnerable to all attacks. Even if their bodies were pierced by spears, or their heads cut off, they would not die. They are totally indestructible, save for one glaring weak point; their armour. The Valderverr were all wearing armour at the time of Skolliath’s ritual, and as their bodies were mutated, the armour fastened and attached to their bodies; thus becoming a part of them. But this only serves as a weak link, as when the armour breaks, the darkness cloaking the Skorned’s body bursts out into the vapour and as a result, the Skorned vanishes. Think of the armour piece as like a patch on a balloon. When the patch is removed, the balloon loses all its air and deflates. Same principle; only they vanish instead of deflate. Luckily for them, their armour pieces are very strong, and would take an equally strong force to break them, hence why the best tactic to approach them is with brute force. But the Skorned all have tricks up their sleeve to prevent this from happening. Being canines, they can switch to anthropomorphic to zoomorphic anytime they please, so they have all the dexterity of fighting as humanoids, with the tenacity of fighting as animals, making them mighty foes. Their dark claws and bright teeth are razor sharp and can pierce metal, and their varied appearances could either make them hulking brutes, or agile fighters. They also have great sense of smell and hearing much like regular dogs. And they can even see in the dark. Some Skorned even carry custom-made weapons, though this comes out of personal taste rather than by orders. They also have the uncanny ability to dive within shadows, making it incredibly easy for them to skulk and attack their prey, or catch unsuspecting opponents off-guard. However, the area of shadows has to be big enough to contain them, and if the shadow area becomes too inconvenient for the Skorned to stay in, they either have to leave fast, or be crushed by the weight of the light. So this is an ability they have to use wisely. Some can even shed their fur through scratching to create small parasites of darkness simply called Dark Fleas. These Dark Fleas can swarm an opponent and bite into them to paralyse their movements. The more fleas that swarm an opponent, the less they’ll be able to move. This creates an ample opportunity for the Skorned to go in for the kill. Finally, they reign as a tactical force through sheer army stratagem and hierarchy. Certain Skorned are hand-selected by Skolliath himself to become Captains of the Skorned grunts and elites. These Captains are blessed with a greater power to take their armour pieces off and plant them onto living things to transform into them and become even more terrifying monsters. They are easily recognisable by their armour plating having horns on them. Skorned can come in a wide variety of breeds, just like dogs. The ones you see here for example are based on Bichon Frises, Cairn Terriers, Coyotes, Dachshunds and Mastiffs. And while they are not androgynous, there do exits male and female Skorned, they do not procreate, they only live to serve Skolliath’s every order. The Skorned were created during the Great War of Dark and Light; an incident that occurred a millennium ago. Yet, for some reason, only now do they attack Yanside, and the world’s residents seem to have no idea who they are or where they came from. Even the Skorned themselves don’t seem to know the other races of Yanside, and find them to be rather alien. What’s more, they’re all searching for something. Or rather, someone. Someone who can cast a spell called “Lumonos”. But why? What is their greater purpose? You’ll have to find out by reading more Golden Sky Hero.